VISINE FOR CONTACTS® Lubricating + Rewetting Drops refresh and soothe eyes, moisten lenses, and help remove particulate matter that may cause irritation and/or discomfort. Because, hey—wearing corrective lenses that wind up ruining your view is not only bitterly ironic, it’s frustrating and uncomfortable. DESCRIPTION: VISINE FOR CONTACTS® LUBRICATING + REWETTING Drops is a sterile, isotonic solution with a borate buffer system, hypromellose and glycerine, with potassium sorbate and edetate disodium as the preservatives. ACTIONS: VISINE FOR CONTACTS® LUBRICATING + REWETTING Drops refreshes eyes, moistens your lenses and helps remove particulate matter that may cause irritation and/or discomfort. LENSES: VISINE FOR CONTACTS® Lubricating + Rewetting Drops is indicated for use with daily and extended wear soft (hydrophilic) lenses as recommended by your eye care professional. Placing 1 or 2 drops of VISINE FOR CONTACTS® Lubricating + Rewetting Drops on the eye followed by blinking 2 or 3 times will relieve minor irritation discomfort and blurring which may occur while wearing lenses. Patients allergic to any ingredient in VISINE FOR CONTACTS® Lubricating & Rewetting drops should not use this product. PROBLEMS WITH CONTACT LENSES AND LENS CARE PRODUCTS COULD RESULT IN SERIOUS INJURY TO THE EYE. It is essential that you follow your eye care professional's direction and all labeling instructions for proper use of your lenses and lens care products. EYE PROBLEMS, INCLUDING CORNEAL ULCERS, CAN DEVELOP RAPIDLY AND LEAD TO LOSS OF VISION; THEREFORE, IF YOU EXPERIENCE EYE DISCOMFORT, EXCESSIVE TEARING, VISION CHANGES, REDNESS OF THE EYE, IMMEDIATELY REMOVE YOUR LENSES AND PROMPTLY CONTACT YOUR EYE CARE PROFESSIONAL. Never touch the dropper tip of the container to any surface, since this may contaminate the solution. If drops turn yellow, do not use and discard immediately. If you notice any of the above problems, immediately remove and examine your lenses. If any of the above symptoms occur, a serious condition such as infection, corneal ulcer, neovascularization or iritis may be present. Seek immediate professional identification of the problem and treatment to avoid serious eye damage. Some users may experience temporary red streaks on the skin. 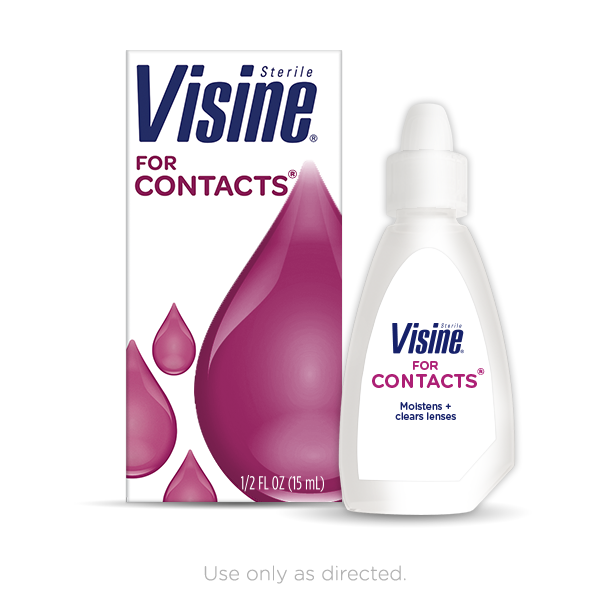 VISINE FOR CONTACTS® Lubricating + Rewetting Drops, produced through a process that ensures sterility, is supplied in sterile ½ FL OZ plastic bottle. The container and carbon are marked with a lot number and expiration date. VISINE FOR CONTACTS® Lubricating & Rewetting drops may be used as needed throughout the day while wearing lenses. VISINE FOR CONTACTS® Lubricating + Rewetting Drops may be used as needed throughout the day. If minor irritation, discomfort or blurring occurs while wearing lenses, place 1 or 2 drops on the eye and blink 2 or 3 times. If discomfort continues immediately remove lenses and immediately see your eye care professional. VISINE FOR CONTACTS® Lubricating & Rewetting Drops is indicated for use with daily and extended wear soft (hydrophilic) lenses as recommended by your eye care professional. Hi there! We’re so sorry to hear about your experience with our Visine For Contacts Drops and we’d appreciate the opportunity to gather a few more details. When you have a moment, please give us a call at 1-888-734-7648 between the hours of 9:00 AM – 5:30 PM ET, Monday – Friday. We hope to hear back soon! My eyes are burning so bad I can’t get my contacts out. With all these people complaining about the same thing Visine should have already taken them off the market before I bought them. We'd like to hear more from you about this. Please give us a call at 1-888-734-7648 M-F between the hours of 9A-5:30P ET. Thank you and have a great day. Caused my skin to burn! This product is terrible! I put drops in my eyes and it ran out of my eyes down my checks, which is normal. What's not normal is a few seconds later my face felt hot and my cheeks burned. I looked in the mirror, and where the drops ran down my face my skin was bright red and burning. The redness and burning lasted several hours, and no the drops did not relieve the dryness from my contacts. Terrible product! We'd like to learn more about your experience using our product! Please give us a call at 1-888-734-7648 M-F between the hours of 9A-5:30P ET. Thank you and have a great day. I just used this product and it left a bright red burn streak down both sides of my face! We want to hear more about this experience. Give us a call at 1-888-734-7648, Mon-Fri 9am-530pm ET and make sure to mention your username. We want to learn more about your experience. Please give us a call at 1-888-734-7648. We're available Monday-Friday 9AM-5:30PM ET. When you call mention your username to our team. We hope to speak with you soon. Causes Allergic Reaction, Do not buy! 3 min after putting this in bright red streaks appeared where the solution had run down my cheeks. Very unsightly and not at all acceptable. We're very sorry to hear this! We'd like to learn more about your experience using our product. Please give us a call at 1-888-734-7648 M-F between the hours of 9A-5:30P ET. Thank you and have a great day. I want to thank you Visine for putting child-proof caps on your bottles! My 2 year old likes to pour my eye drops out and seems to find them no matter where I put them, she is not happy right now that she cannot open your bottle! As I was trying to find the product, which is sold out at every Walmart I have checked for some time, I saw numerous negative reviews about Visine for Contacts outlining some type of skin reaction. I wondered if it could possibly be some make-up reaction as all negative reviews appeared to be from females. I have used Visine for Contacts for many years with no problems - it is economical in price as well.